Some find them exciting, some find them scary, some think they are just plain creepy. The praying mantis is a truly unusual carnivorous insect with alien-like features and a mean bite. While there are loads of praying mantis facts to be found, some are definitely more interesting than others. A praying mantis is a carnivorous insect belonging to the mantid family. This large family includes about 1,800 different species, which average in size from 0.5 to 6 inches. It's the bigger ones that most people think of when they think of praying mantises. Praying mantises are found in temperate climates and thrive best in areas of moderately high humidity. About 20 mantis species are native to the United States, but the European and Chinese versions of the insects have also been introduced, mostly in an effort to control pests on farmlands. The insects range in color, usually looking pea green or brown, but there are also mantises in various shades of green and even pink. They are named praying mantis because of the folding of their front legs, which looks like the posture of prayer. Some people mistakenly call them " preying" mantises, which is also somewhat accurate, given their skill as hunters. Praying mantises have triangular-shaped heads and compound eyes. Praying mantises can rotate their heads 180 degrees. Praying mantises have long spines on their front legs that allow them to hold on to their prey. According to French folklore, the praying mantis can lead a lost child home. The praying mantis is more closely related to the cockroach than the grasshopper. The word "mantis" means prophet in Greek. Praying mantises are exclusively predatory - they only eat other animals. Praying mantises are the only insects that can catch flies and mnosquitoes. 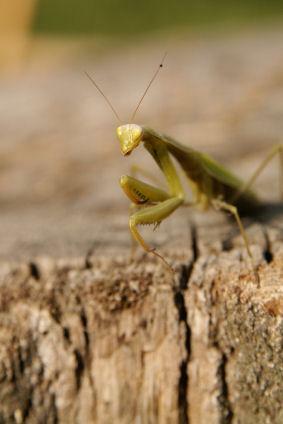 Larger members of the praying mantis family have been known to eat lizards, snakes, frogs, birds and even small rodents. Some people suggest praying mantises as a method of organic pest control, but you should also think about the beneficial insects that may suffer when you introduce a predator into their habitat. If you are interested in hatching a praying mantis (or a bunch) in your garden, you can buy mantis eggs online. It is perfectly legal to keep and sell mantises and their eggs when they come from species native to the United States, but one should keep in mind that all non-native species obtained from outside of the United States may require a permit from the United States Department of Agriculture. If you are unsure, consult your local Cooperative Extension Office for more information. Praying mantises are interesting to watch, even when they're not doing anything particularly interesting. For most children and adults, it's still pretty novel to see a praying mantis up close, and they are strangely beautiful even as they are really odd-looking. If you happen to see one while it's hunting, it's an unforgettable sight. It's great fun to learn praying mantis facts and gain a new appreciation for this amazing species.